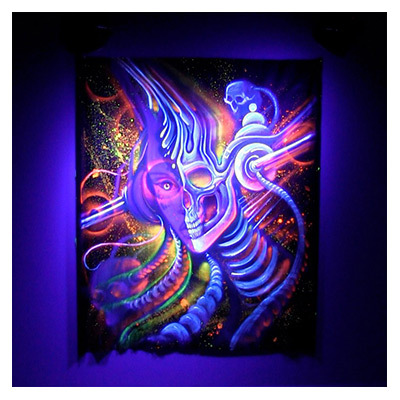 Popular in nightlife venues since the psychedelic ‘60s, black light effects are just as prevalent at today’s parties and concerts. These days, however, the dazzling effect of UV light shining on white or fluorescent materials can be created using the latest LED technology instead of the fragile lamps of the past. What’s more, using ADJ’s brand new UV 72IP, these effects can now be created outdoors in any weather. A professional-caliber fixture, the UV 72IP is designed for situations when you require a large amount of UV illumination. Packing in twenty-four 3W UV LEDs, and with a beam angle of 33-degrees, this fixture is capable of generating a potent wash of UV light that will travel a significant distance. With a life expectancy of 50,000 hours, the flicker-free LED light-source of the UV 72IP is far superior to traditional lamp-based UV wash fixtures. It also offers the added advantages of 0-100% digital dimming, with a choice of five different dimmer curves, and variable-speed strobing with a flash rate that can be adjusted between 0.2Hz and 11Hz. Enclosed in a robust all-metal case, the UV 72IP has been created for professional touring and events use. It is also weatherproof with an IP65 rating, which means that it is ‘dust tight’ and protected against water, even if it is projected through a nozzle. In practical terms, this means that it can be used outdoors, even if it is subject to heavy rain, and also on beaches or in other locations where sand or dust could be blown onto the fixture. In addition to the sealed metal construction of the fixture itself, the UV 72IP is also fitted with high-quality trailing Seatronic water-proof connections. 3-pin XLR sockets allow the linking of a control signal, while professional powerCON input and output sockets allow the power supply for multiple fixtures to be connected together. This means that two or more units can be connected to a single mains power supply, reducing the number of power cords required and therefore minimizing setup times. Not only can the UV 72IP be incorporated into a traditional cabled DMX setup it is also equipped with ADJ’s WiFLY EXR extended range wireless DMX technology. This allows the fixture to receive a wireless DMX signal, sent by a compatible controller or transceiver, from a distance of up to 2,500 feet / 760 meters (open line of sight). The flexible fixture is equipped with a scissor yoke that can be used as either a variable-angle floor stand or adjustable hanging bracket. The two sections of the yoke swing apart to create a sturdy stand that allows the unit to be positioned on the floor of a stage or venue to provide up-lighting duties. Alternatively, the two sections can slide together to form a single bracket to allow a clamp to be attached which in turn can be used to mount the fixture to a truss or lighting gantry. Two separate pairs of thumbscrews allow the bracket to be securely fixed into a chosen position, with one pair locking together the two sections of the bracket and second pair locking the fixture itself at any chosen angle. A choice of three channel modes (1, 2 or 3) is offered for DMX control, while the unit is also compatible with ADJ’s UC-IR and Airstream IR remote control devices (sold separately). The fixture features a 4-character LED display, paired with four selection buttons, that provides a menu-driven interface for mode selection and DMX addressing. This also allows the fixture to be setup for standalone operation using a choice of UV Dimmer or Fade modes. With measurements of 8.25” x 11.50” x 8.50” / 208.5 x 292 x 215mm and a weight of 12 lbs. / 5.5 kg., the UV 72IP is a significant fixture but one that is easily manageable for transport and rigging. 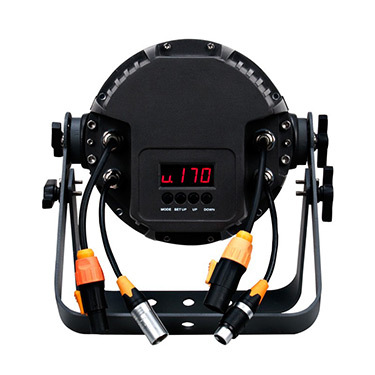 It also offers multi-voltage operation, which means that it is suitable for worldwide touring productions. 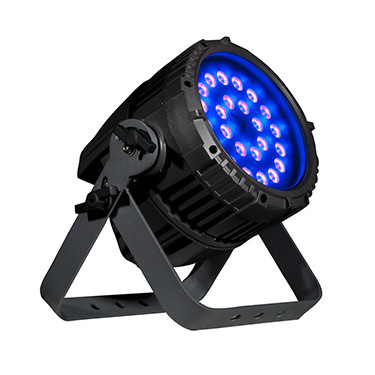 The UV 72IP produces a high-intensity ultraviolet light designed for outdoor performance stages, theatrical performances and special events. If you’re looking for a powerful and robust UV fixture that can be used absolutely anywhere, this is the ideal product to add to your lighting arsenal.